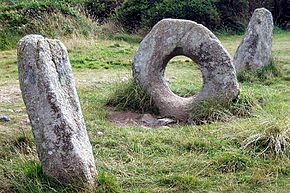 Holed stones are upright slabs that contain a circular hole. They are considered to be Bronze Age circa 2500 – 1600 BC, as many of them seem to be associated with nearby Bronze Age sites. Their purpose is a complete mystery, and although it has been suggested that they might have been part of a burial chamber there is no evidence for this. 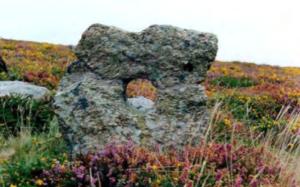 The Men-an-Tol is the most famous holed stone in Penwith, large enough for a person to crawl through. It is associated with many folk legends of fertility, divination and healing.